Rosacea is an uncommon but under-diagnosed skin care condition that presents most often in women in their 30’s as a bright red flushing appearance that occurs on the cheeks, nose, and chin. This redness can be quite intense in some women, and is usually made worse by any number of triggers which can include sun exposure, spicy foods, alcoholic beverages, and harsh skin care products. In the most severe cases of rosacea, the flushed skin can also burn, especially when cosmetics are applied, including soothing creams that many women try to self-treat themselves with. Rosacea also has several variants that present in different ways, but the most common form is due to inflammation surrounding the small capillaries and blood vessels in the skin. The cause of this inflammation is unclear, but treating it is critical to seeing an improvement from clinical therapy, and IPL and OPL are cornerstones of laser treatments for rosacea. Why Is Rosacea So Hard to Treat? Melasma can be incredibly difficult to treat because there are so many factors involved, and not all of these factors can be controlled all the time. Some factors such as sun exposure and a genetic predisposition towards a higher level of severity cannot be adjusted, and the condition also tends to worsen if left untreated. Since most cases of rosacea often go undiagnosed for years, this can be a common issue when starting treatments. Cases where flushing is less severe and there is no burning sensation are usually more responsive to standard treatments than cases where the skin flushes bright red and the skin burns intensely when anything topical is applied. Regardless of the severity of the condition, rosacea usually responds best to combination treatment protocols that attack the problem from all possible sides, rather than bouncing back and forth through a never ending series of individual treatments. The most common treatment failures that we see in consultation for a second opinion are those that were treated with only creams or pills by another doctor without incorporating any form of laser therapy. Laser treatments are almost universally necessary to treat even the most mild forms of rosacea, and therefore OPL and IPL laser therapy sessions are the cornerstones of our Rosacea Treatment Triad™. What Is the MAS Rosacea Treatment Triad™? The MAS Rosacea Treatment Triad is the only way we treat rosacea in our practice. It is a specific combination of laser treatments, sunscreen, and an oral/topical anti-inflammatory regimen that is designed to treat even the most severe forms of rosacea to get the best results in the shortest amount of time. Our treatment protocol is far more effective than any individual treatment or product used by itself, and is far less confusing than the myriad of other treatment regimens available. Zinc Oxide Sunscreen: It is absolutely imperative that rosacea patients use a high quality clinical sunscreen every single day, even when not directly exposed to the sun. A single brief period of unprotected sun exposure will cause a flare in most rosacea patients, and can ruin months of expensive treatments. The product we use is a clinical formulation that includes excellent UVA and UVB coverage, goes on clear, and is light and comfortable enough to wear under makeup. Optimized Pulsed Light therapy (OPL, or the older version of this technology called IPL): Every 2-3 weeks you’ll receive a 15-minute OPL or IPL treatment designed to collapse the inflamed capillaries and blood vessels that cause the flushing of rosacea. This treatment is similar to that involved with treating broken capillaries on the sides of the nose, which is not the same condition as rosacea even though it is treated similarly. The treatment is nearly painless and there is essentially no downtime. Laser therapy is the single most important step in treating moderate to severe rosacea, but is ironically one of the most overlooked therapies. For most patients 4-6 treatments are necessary for a noticeable improvement. How Can I Get More Information about laser treatments for rosacea? 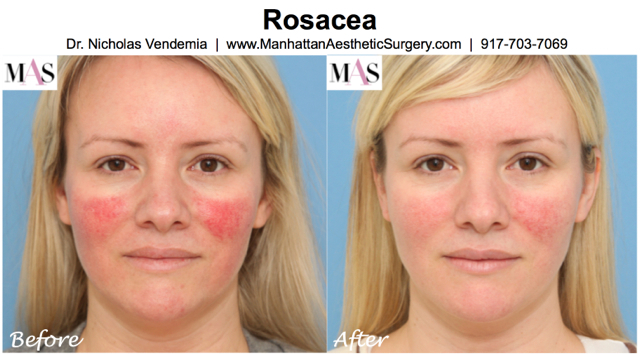 To learn more about laser treatments for rosacea or to schedule a skin consultation with Dr. Vendemia, please contact us online or give Manhattan Aesthetic Surgery a call at 917-703-7069. Dr. Nicholas Vendemia performs laser treatments for rosacea for men and women in the New York metro area. We encourage you to contact us online or give Manhattan Aesthetic Surgery a call at 917-703-7069 to schedule a visit. Dr. Vendemia is a leading cosmetic surgeon in New York City with a reputation for custom care and excellent results.